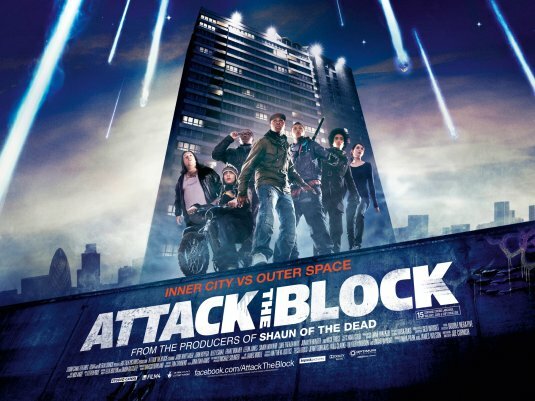 Attack the Block is a 2011 British science-fiction film that combines action with wit, social commentary and comedy. 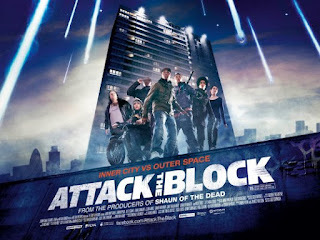 Ruffian (multi-racial) teens from a South London council estate (the projects), find their Bonfire Night thievery interrupted by an alien invasion, and a (white) nurse unites with them to defend their homes. The film is an energetic ride, suspenseful and funny, that also has commentaries on race, class, police violence, and lack of opportunity. in the lot across from Shoppers Corner on Soquel Ave.
PLUS thrilling short films, an intermission, great company and a guaranteed good time! BRING blankets, pillows, anything you need to be comfortable in the great outdoors, friends, snacks to share. Donations to support the project are more than welcome. SANTA CRUZ GUERILLA DRIVE-IN is an outdoor movie theatre under the stars that springs up in the fields and industrial wastelands. Beyond showing great movies and bringing a broad community together, part of our mission is helping reclaim public space and transforming our urban environment.